Part of my agenda for this trip to Santa Cruz and environs had to do with a novel I’m writing. I arrived with a list of locations to scout. Thanks to Ginny and Jeb’s patient chauffeuring and on other days my daughter’s use of a borrowed car, we managed to tour neighborhoods, the campus, the business districts, and the beach. I made copious notes. Questions arose. 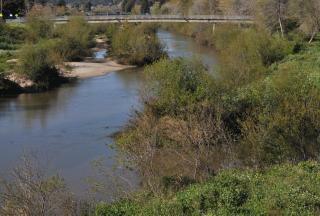 Why is the San Lorenzo River dry at the crossing of Highway 1 and full of water further downstream near the coast? Why is Fire Break Road shown on the map stretching from Empire Grade down to the backside of campus but doesn’t exist in the real world? 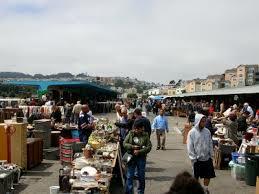 Alemany Farmers Market, Bernal Heights, San Francisco. First farmers market in California, established in 1943. A flurry of investigation resulted in answers. The San Lorenzo is dry because of a two year drought, and the lower riverbed holds captured water because of a sand bar blocking the mouth where it drains into the Bay, creating what amounts to a long lake. No answer on the missing road. 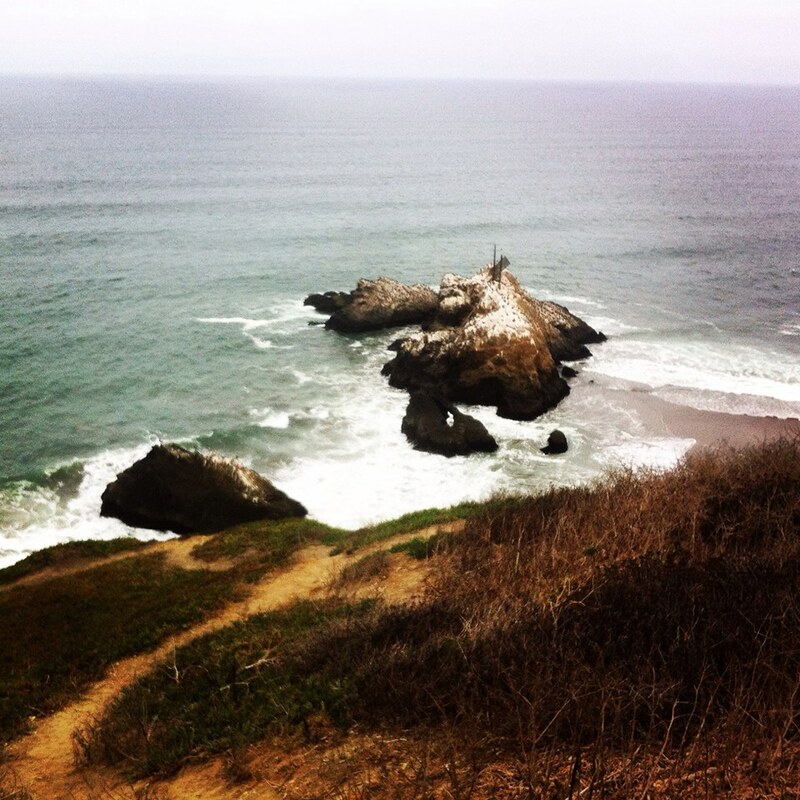 We spent a day in San Francisco, tracking sites of my fictional events. The Alemany farmers market is surrounded by steep hillsides with rows and rows of colorful houses built literally wall to wall. 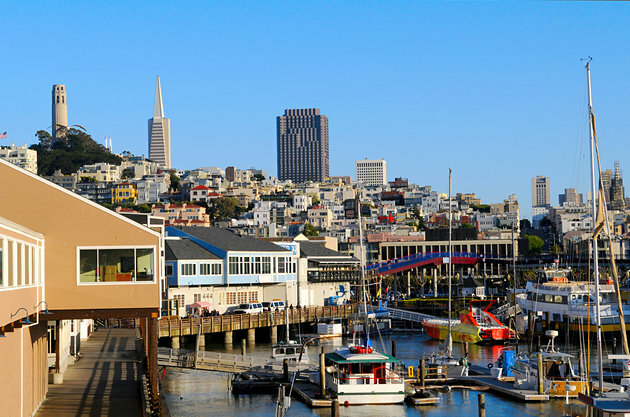 The Embarcadero stretches along its long waterfront up to the Presidio—shops, wharfs, boats in sheltered marinas, mobs of tourists. Jeb and I ponder a large outcrop of serpentinite rock at the point. 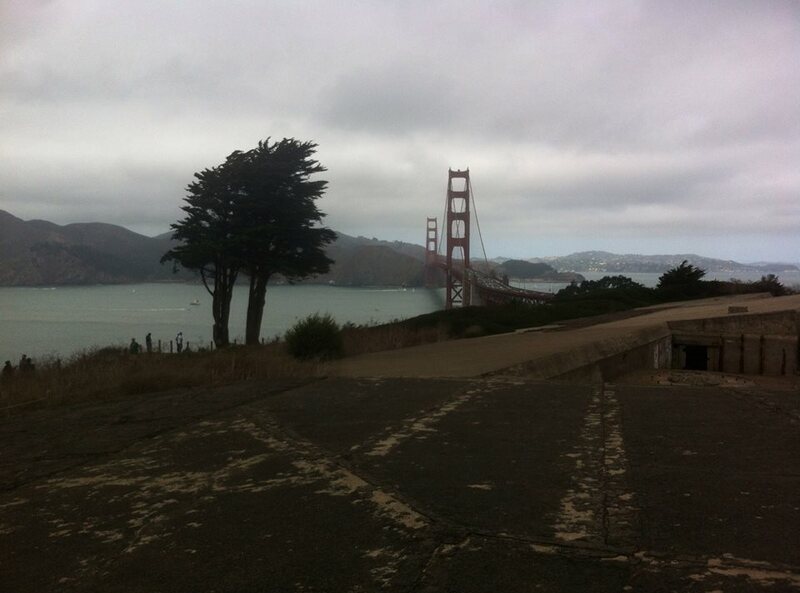 First pier of Golden Gate Bridge looms above. Photo courtesy Deste Campbell. 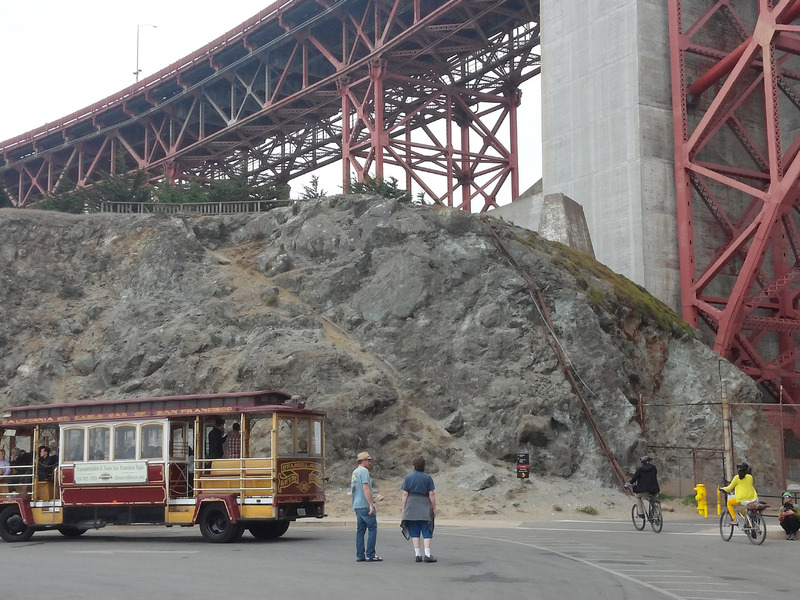 We walked along the old airplane landing strip, Crissy Field, and pondered the Civil War era red brick structures at Fort Point. Directly overhead, traffic thundered onto the Golden Gate Bridge. The narrow drive skirted a sharp embankment of crumbling pale green serpentinite that slopes down to sea level. We drove up along the west-facing oceanfront cliffs of the Presidio where groves of redwoods shelter World War II artillery batteries. Ghosts of men in uniform seem to emerge from hovering redwood thickets. The urgent need to guard against invasion left its acrid residue in the air, in the massive concrete bunkers, along the pathways carved through the rugged terrain. What threats, real or imagined, kept these men awake at night, shivering in the cold coastal wind? 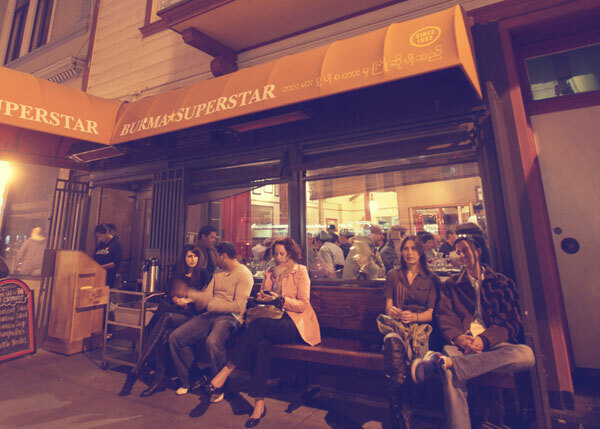 Lunch involved Ginny’s son Warren and his family at a hole-in-the-wall place on Clement Street serving Burmese food. After a wait on the sidewalk made friendly by a bench and hot tea, our party of eight was seated at a large round table. How does one describe a Burmese feast? Savory catfish chowder, thick lentil/cabbage soup, lamb curry, coconut chicken rice noodle curry, tea leaf salad, crisp samusas—the large lazy susan kept turning as we sampled our way to gluttony. Sated by our delicious meal, we said our goodbyes to Warren and his family. Our search for story settings then led south along the coast following the “Great Highway.” Densely populated streets disappeared behind us as the road merged with Highway 35. 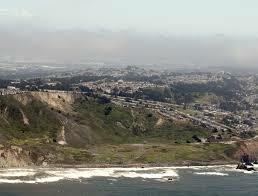 Soon our path became Skyline Boulevard as we neared Daly City. Our objective? The great and powerful magic spot at Mussel Beach, where the San Andreas Fault leaves land and enters the Pacific. At Mussel Rock, looking north by northwest along the trajectory of the San Andreas Fault. We missed the turn-off, assuming that such an important spot would be well marked. After doubling back, we found Mussel Beach disappointingly under-developed and lacking any signage that might describe the forces at work underfoot. The narrow shelf of land broke upward to the east with a steep eroding hillside and to the west down a sharp crumbling embankment to the turbulent surf below. Offshore, waves pounded the tilted outcrops of broken rock which continued the fault’s northward journey. The mostly paved ‘park’ area rolled and humped over conspicuously-disturbed ground. Multiple patches in the asphalt provided evidence of the fault line’s restless character. Mussel Rock shown with neighborhoods behind it. Rock outcrop from previous photo appears lower right. Hovering above the precarious cliff faces and uneven terrain, housing developments cling to steep hillsides and beg the question of how anyone could in good conscience build houses literally on top of a major fault. The neighborhood centers on an elementary school and seems inhabited mostly by lower income residents. I took notes for my story as we rejoined Skyline Drive. 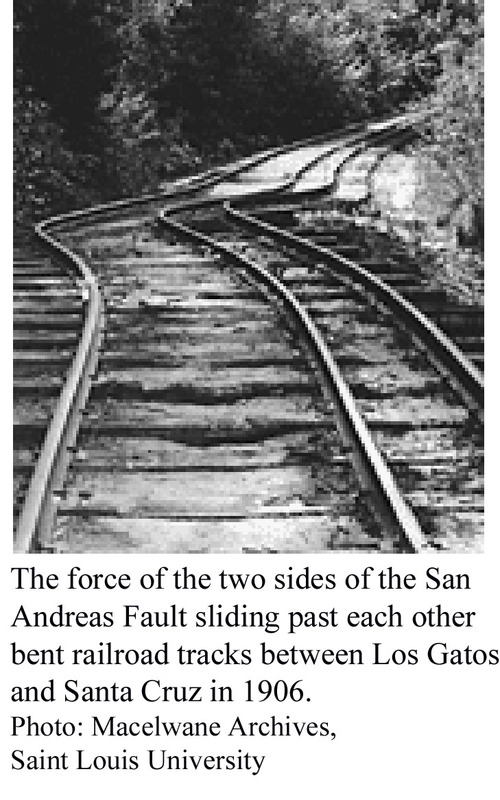 The drive back south along Highway 280 tracked the trajectory of the infamous fault. The miles-deep gash forms a valley between the Santa Cruz Mountains on the west and the less dramatic hills and rolling lands of the southern Bay communities of San Mateo, Redwood City, and Santa Clara. For part of the distance, San Andreas Lake glimmers in the day’s bright sunlight. Angling west onto Highway 85, and then Highway 17, we soon crossed over the fault itself at Los Gatos. The four-lane road jagged and bumped as it crossed the extended disturbance. Then back to Santa Cruz. It struck me at this point that highways and landmarks tell only part of the story of what it means to be here. Less specific but more important is the feeling of the place. A unique scent permeates the air—pine, salt, kelp, eucalyptus. And something else I can’t name. It lingers in my clothing, on my skin. The light is clean, thin, sharp. Fog rolls in and drapes over the roofs, hides the tree tops, waxes and wanes along the shore so that at one moment you see the lighthouse on the point, the next moment it disappears. The whole place sits on an edge. The edge of the sea. The edge of light. The edge of visibility. Here is the edge of North America, not part of the land mass that comprises the bulk of the continent but a sliver of earth’s crust emerging from the sea to shove eastward and cling to its reluctant partner continent. The energy of the rebel, the upstart, the adolescent swells from this nascent ground, lending its attitude to the human settlements that occupy it. From the shore eastward for a hundred miles, this new land presses its case, shoving up mountains and sliding along the tear called the San Andreas fault. Countless other faults branch off from it, all mute testimony to the mind-boggling forces at work on our planet. You can’t live along the California coast and not feel the energy of this subterranean collision. What better place to set a novel that deals with the frontiers of human consciousness? 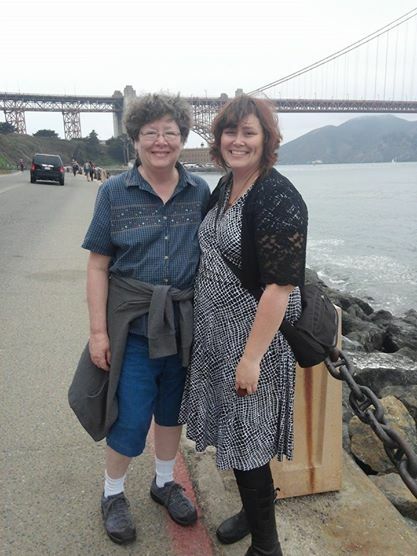 This entry was posted in Uncategorized and tagged author, burmese food, Golden Gate Bridge, Mussel Rock, Pacific Ocean, Presidio, San Andreas Fault, San Francisco, Santa Cruz, writer, writing on October 7, 2014 by Denele Campbell. When a 6.1 shallow quake hit near us in 2009 we went to see the results close to the epicenter over jagged roadbeds and tumbled edges. It is an area I knew well, but the “feeling” of the place left me very uncomfortable and I wanted to leave. The damage there and our own experience was too close for comfort. The change in the landscape was too raw and painful, making it apparent that something horrible had happened there. When we visited the San Andreas fault area in the ’80’s we walked into the land and viewed a fence line with a significant jog. It was interesting, but we had none of the emotion of our own personal experience in Costa Rica. There is definitely a feeling in such places!